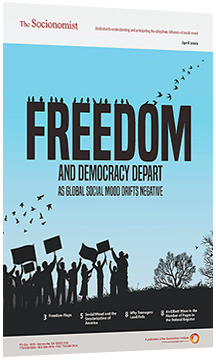 The July 2016 issue of The Socionomist noted that socionomic theory “topples the entrenched belief that politicians and leaders can control their own political destinies.” Instead, social mood regulates many political outcomes and influences the public’s perception of leaders. Thus, an incumbent candidate’s victory or loss may not reflect his or her level of competence. In Germany’s upcoming federal election, Chancellor Angela Merkel is seeking another term as Germany’s leader. How may the current social mood influence her chances for victory? An article by Chuck Thompson in the September 2017 issue of The Socionomist provides some clues. Following are excerpts from that article.